For an alternative VPN solution, see Hamachi and Private server. 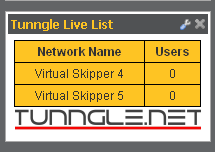 Tunngle is free virtual private network (VPN) software and allows any interested parties to extend their local area network (LAN) to include computers at remote locations around the world. It is a secure network that behaves like a LAN when it comes to hosting and joining multi-player games that support a local network style of game play. Your LAN party options are no longer limited to the one room or building. In this way it functions very much like Hamachi. 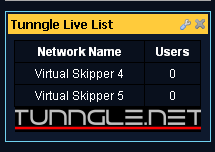 At www.tunngle.net/network-browser you can see a live list of Tunngle channels and the number of users in each channel. That list can be sorted and filtered seven ways from Sunday for those who care to play with it. It seems like a good idea to have a more succinct version of this available to Wikia's community of wikis. Although Gaming wikis may seem like the primary benefactors there is no reason why other Wikia communities should not take advantage of this easy to setup and use VPN technology. 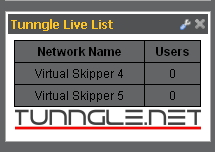 The so-called Tunngle Live List rendered below is based on live data retrieved from www.tunngle.net and will update each time the page is refreshed. 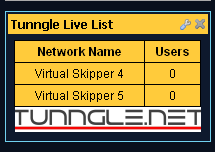 The list is not interactive because this wiki really only needs to see the Virtual Skipper channels. Enable this gadget via your Special:Preferences "Gadgets" tab to use it in the sidebar or widget dashboard. A demo version was used above and at the home page Featured article section. There are two methods. One that uses the custom WikiPage widget MediaWiki:Widget-tunnglelivelist and the other which does not. The additional page load time is noticeable especially if the user has already filtered advertisements from loading. Do I have to remember all of that markup? No. If you just visit MediaWiki:Widget-tunnglelivelist and view the source wiki markup code then you'll be able to copy and paste it to whichever wiki article you are creating. Hopefully you will agree that the WikiPage widget approach is more convenient. If you've forgotten how to get that widget into your Monaco sidebar or your Special:WidgetDashboard then review Help:Widgets to refresh your memory. The gallery below lets you see, for each of the standard Monaco skins available at Wikia, just how this gadget-in-widget renders in the sidebar. This choice can optionally be specified right alongside the tunngletablearea class name used in code block displayed in the next section. These are © tunngle.net and permission has been granted to use them at any tunngle fan site. There is one skin whose default color scheme seems to be flawed - Brick color2. The fix (see the very last image in this gallery) is a simple one-liner in your wiki's MediaWiki:Monaco.css message. viz. Do I need to use a gadget? No you don't. Choose to do so only if you want to allow any user who does not wish to be bothered by the additional load time to easily disable the feature via their Special:Preferences. Of course you could copy the JS code into your wiki's MediaWiki:Monaco.js (or MediaWiki:Common.js) and the CSS code into MediaWiki:Monaco.css and the code will run for every visitor to your wiki. You will still need to use the minimum required wiki markup code somewhere on your target wiki page to let the code take effect. If that code is in the sidebar then keep in mind that it will refresh the list on every new page load. Do I need to use a widget? No you don't. It happens to be a convenient way for the Live List to be dragged and dropped into either the Monaco sidebar or the Special:WidgetDashboard. As noted in an earlier section, embedding a widget using a pair of <widget> tags is also the most convenient. Any wiki article that has a pair of <div class="tunnglelivelist"> ... </div> tags will cause the list to be rendered at that specific location on that page. Edit the line: .append("<div class='tunngleloadingarea'>Loading Tunngle network data</div><div class='tunngletablearea' style='display: none'><table class='tunngle color2'><thead><tr><th>Network Name</th><th>Users</th></tr></thead><tbody></tbody></table></div>"); ... Of course you can remove the second of the two class names altogether if you wish. A table will still be created from dynamic data if you accidentally delete the tunngle class name however you should not expect the cascading style sheet (CSS) in the next section to yield the same sidebar widget that you see in the gallery above. The following styles were used to yield the skin swatches in the gallery above. Use this as a baseline but feel free to customize further. How can I make every second row in the list use a different background color? If the list of channels is more than 2 or 3 then this can certainly enhance readability. Although not illustrated in the gallery above, every odd numbered row has the class 'row1' while every even numbered row has the class 'row0'. Note the pair of lines at the end of the CSS listing above - they are commented out. That's where you can specify suitable alternating background colors that match your wiki's color scheme. You must have a sysop/admin at your target wiki create the gadget. The MediaWiki namespace is viewable by any user but can only be edited by a sysop/admin. Visit Special:Gadgets at the wiki you are now reading and notice there are three links for the tunnglelivelist gadget. Visit each of those pages and copy the source code to a newly created page of the same name at your target wiki. Visit MediaWiki:Gadgets-definition and copy the bullet line item corresponding to tunnglelivelist to a MediaWiki message of the same name at your target wiki. Yes, the page name prefix is Gadgets- with an "s" ... I dunno ... go figure! Now at your target wiki's Project:Sandbox paste the following code and save the page. If you followed those steps then nothing should render under the Minimal heading and the only thing that should appear under Suggested is a very small on/off link at the far right. That's the way it is supposed to work. i.e. Rather than requiring users to opt-out of using this gadget you invite them to opt-in. Why Wikia consistently ignores this simple piece of common courtesy, we may never know! OK so now refer to the steps described at #Not using the widget above to enable and verify the correct display of the table within that sandbox page. 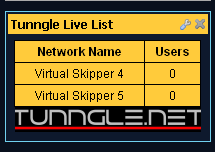 That will get the Tunngle Live List into a wiki article but what about the sidebar or the gadget dashboard? For that you need a custom WikiPage widget. Create the gadget before creating the widget. You don't need a sysop to create the widget unless you plan on creating that widget in the MediaWiki namespace as has been done at the wiki you are now browsing. Whether you create the widget in the MediaWiki namespace or the Main namespace or even in a sub-folder below your personal user page you would be well advised to give this widget definition page the prefix Widget-. This is not a requirement, just a suggestion. You really need a custom WikiPage widget to get this Tunngle Live List displayed in your Monaco sidebar or any one of the three columns of widgets at Special:WidgetDashboard. Once you have created the gadget creating the widget is a walk in the park! At your target wiki - create the page MediaWiki:Widget-tunnglelivelist - this becomes the custom WikiPage widget definition source page that any visitor may use if they want this feature in their sidebar or their widget dashboard. Source page name is important only to the extent that as other Wikia hosted wiki's adopt this gadget-in-widget feature then as you browse to one of those other wikis the widget will appear in your sidebar or dashboard auto-magically only if all wikis adopt the same MediaWiki:Widget-tunnglelivelist name for the Source page. Save the page and, if need be, refresh and/or purge the browser's cache (CTRL+F) to see the rendered result. If you had not yet checked the appropriate box in your personal preferences then refer to the steps described at #Not using the widget above to enable and verify the correct display of the table at the newly created Source page for this custom WikiPage widget. Now return to the Project:Sandbox at your target wiki then paste and save two more lines to the markup you had pasted while verifying the gadget created earlier. viz. Notice how embedding the custom WikiPage widget produces a different size table than the previous two. Finally, if you've forgotten how to get that custom widget into your Monaco sidebar or your Special:WidgetDashboard then review Help:Widgets to refresh your memory. The thumbnail at right may be all the prompting you need. You may choose any Title of widget you like however Tunngle Live List is suggested. You should copy MediaWiki:Widget-tunnglelivelist into the Source page: field. 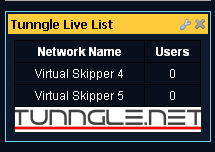 Why am I seeing this failed to load message in the Tunngle Live List widget at every other wiki I visit! Well that's because Wikia don't yet see Widgets as a high priority feature. Give them time but more importantly, give them your feedback! The interim workaround is simple and one that will make widgets a valuable tool to use at many wikis. To learn about the interim workaround visit this user blog. Also please revisit that blog after you've tried the workaround and leave your comment to let Wikia staff know whether or not this is how you would like to see missing widgets dealt with.